A Squatter event is a gathering of people who participate by playing Squatter. 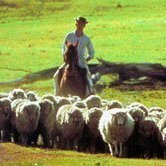 It can take many forms and could be conducted as Café Night, or in a Woolshed / Shearing Shed or as part of a display at a local show. It may be run just for fun, or as a fee-paying fundraising activity by a school or local service club. A Squatter event often takes the form of a Competition and we can provide suggestions to help you run a Squatter competition. Usually (but not always) prizes are offered for the winner(s). We have some material available to assist you (or any interested person or group) to conduct a Squatter Event. Squatter is an ideal game for the focus of an event, particularly because every player stays in the game until the end, and it is flexible with the number of players. If you register your Squatter Event/Tournament with us we will post the winner in the Squatter Hall of Fame.